It's really heating up here! It looks like we are in for triple digit temperatures all next week. Our apricots are starting to ripen...yumm! Today I made a salad for lunch with lettuce, cucumbers, bell peppers, zucchini, onions and tomatoes from our garden! The flavor in everything was intense compared to store-bought! It is a struggle with the heat to make sure everything gets enough water. With the extra heat, the raspberries are taking a bit of a rest but they will be back in August for another run! My card for you today (I still have a few I haven't posted yet) is one I made for Margarita's Wedding Card Swap last month. I love black and white--looks so elegant! 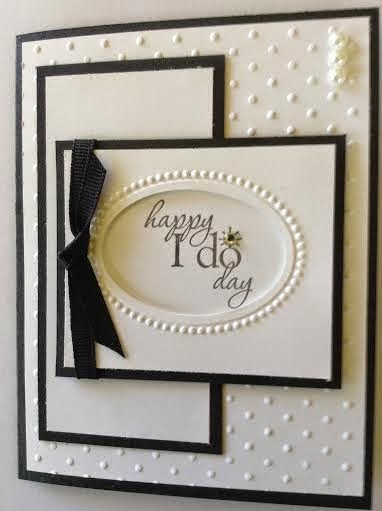 As often happens, I totally CASEd this card from one I saw on Pinterest by Wanda at My Creative Corner. I couldn't even think of how to make this card better so remade it just as Wanda had. Thank you for stopping by today! Have a great day and try to stay cool! I will see you tomorrow for 5 Things Friday! That sounds like a good salad. Thanks William and yes, it was yummy!